Have leftover Thanksgiving pies? 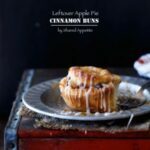 Put them to good use at Friday morning breakfast with these quick and easy Leftover Apple Pie Cinnamon Buns! I know. Leftover apple pie? Hahahahahaha… that’s a good one. There won’t be any leftover apple pie. I hear ya. But hey, if your family is anything like mine, there will be approximately 427 desserts on the table this Thanksgiving and everyone will have already unbuttoned their pants from the main event. Except me. I’ll be in sweatpants at this point (the elastic band is key, as it expands with my gluttonous Thanksgiving stomach). We want to try all the desserts, so we take a little tiny bit of this and a sliver of that. And always… there is always leftover pie. Always. And when I wake up the next morning, my mind always goes to that darn pie. I have a major sweet tooth. Sweet teeth actually. That’s how much I like dessert. I have multiple sweet tooths. Ladies and gentlemen, I present to you… Leftover Apple Pie Cinnamon Buns. And listen, you can totally use any pie you want. Feel free to stuff yo’ buns with whatever goodness you have lying around. Make ’em Leftover Thanksgiving Cinnamon Buns. 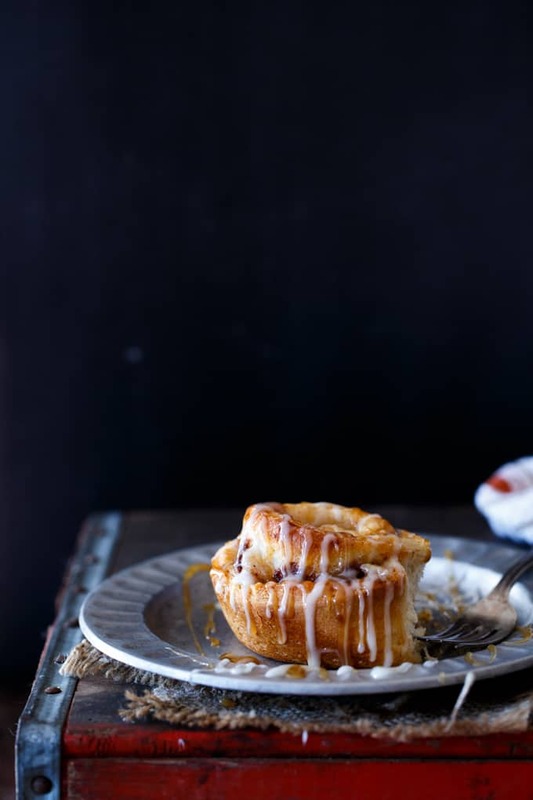 I’m just a huge fan of apple pie… thus the Leftover Apple Pie Cinnamon Buns. Yes. I did use store-bought cinnamon rolls. Because really, who wants to make from-scratch cinnamon buns the day after an all-day cooking and eating marathon. I’m all about convenience (and pie) on Friday morning. Preheat oven as directed on tube of cinnamon roll dough. Remove filling from slices of pie and reserve the crust for snacking. Chop up any large pieces of apple and place filling in small bowl. Carefully unroll cinnamon buns from tube and spread apple pie filling in the center of each strip of dough. Although it’s tempting, try not to overstuff with pie filling or else it will be more difficult to re-roll. Re-roll cinnamon buns and place in a lightly greased pie plate. Bake as directed on the tube of cinnamon rolls. Your tube of cinnamon rolls might have included icing. If so, feel free to use. If not, whip up some glaze and drizzle the heck out of it on top of the cinnamon rolls. For extra indulgence, feel free to put some caramel sauce on top too. In a small bowl, combine sugar, butter, and vanilla. Stir in milk slowly, until the desired glaze consistency is reached. Our families sound EXACTLY a like! Can’t decide on one kind of cheesecake to make? MAKE 10! And then pie in a cinnamon ROLL? I WANT THAT. Pinned! What a brilliant idea, IF there are any leftovers, right? Have a great Thanksgiving Chris! What a genius idea! I love that you used store bought cinnamon bun dough, too. I’m totally for shortcuts sometimes, especially on holidays! You hit the nail on the head about what I was thinking…”Leftover pie?! 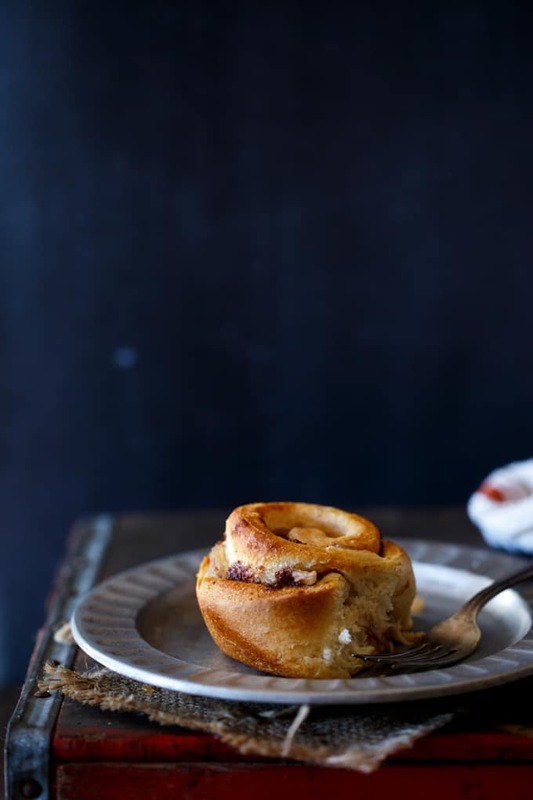 As if!” These cinnamon buns look delicious, though…I’ll keep them in mind if we have any pie to spare. Happy early Thanksgiving! You know I have a major sweet tooth, too, and that I am all about dessert for breakfast! This looks perfect! Hahaha…Amazing, Chris! You just blew my mind with how easy and awesome this recipe is. My mother-in-law loves to go in for pie for breakfast…but not me. However, throw that pie in some cinnamon bun dough? Yeah, now we’ve got a party for sure! Nice work, my friend. Happy early Thanksgiving to you and Asheley! I love this idea, Chris! What a great way to use up leftover pie.